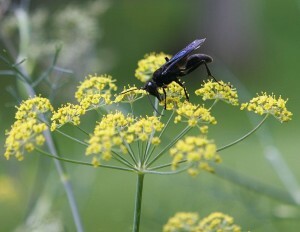 Fennel, Foeniculum vulgare is another of those feathery herbs, with umbels of small yellow flowers, that makes an excellent predator attractant. It attracts hoverflies, which will then keep the aphids under control, as well as parasitic wasps and tachinid flies. In Greek mythology Prometheus used the stalk of a fennel plant to steal fire from the gods. 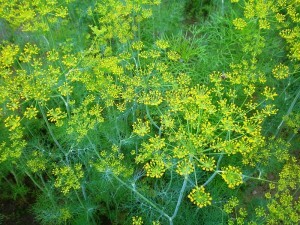 Nowadays we tend to grow fennel for its looks as an ornamental but also make use of the leaves in salads or as a garnish. The leaves are apparently an excellent accompaniment to snails, olives and fish dishes. Whole, ground or cracked seeds can be used to flavour bread, biscuits, fat meatrs such as pork and sausages, in particular finocchiona an Italian salami. The flower heads can also be used to flavour capers. Dried stems also have a use for barbecuing fish and the bulbs of Florence fennel can be used as a root vegetable. Foeniculum vulgare is a tall, clump forming biennial or perennial depending on the climate. 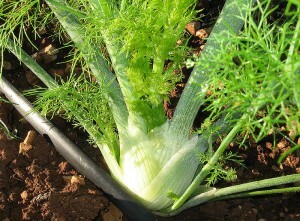 Florence fennel (Foeniculum vulgare var. dulce syn. var.azoricum) is a smaller plant with bulbous stalk bases. ‘Mammoth’ is a slow bolting Florence fennel best sown in the autumn. ‘Perfection’ is a fast growing Florence fennel developed for northern climates so might suit those in the North of the UK better. If you’re looking for something a bit different try bronze fennel ‘Purpureum’. With its deep brown foliage Bronze fennel makes a lovely contrast in an ornamental vegetable garden or herb bed. ‘Smokey’ is a superior bronze fennel with a sweet, liquorice like flavour. Fennel can be grown from seed sown in Spring after any frosts. Seeds will germinate at 13-18 °C. It likes a sunny position in a fertile, well drained, loamy soil. On clay soils and extra layer of sharp sand will help it settle in. 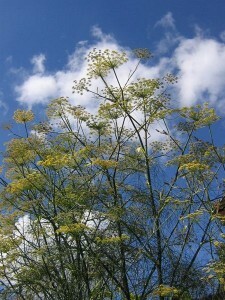 Avoid planting your fennel near dill or coriander as cross pollination will reduce seed production. You can also create more plants by division and of course it will self seed. Generally I tend to stick to growing perennial herbs rather than annuals or biennials but feathery dill with its tendency to enhance rather than dominate the flavours of many foods is one annual / biennial that it’s worth making an exception for. The name Dill comes from the Anglo Saxon dylle or the Norse dilla meaning to soothe and lull which presumably relates to the reported medicinal properties of Dill as a treatment for coughs, headaches and for calming infants with whooping cough. I’m more interested in the culinary uses of herbs of which dill has many. Both the leaves and seed can be used so bolting/ running to seed isn’t a massive problem. The seeds are sharper and more pungent than the leaves though so you may need to adjust your quantities if substituting one for the other. You can also use the flower heads before they have set seed. Add the flower head to a jar of pickled gherkins, cucumbers or cauliflowers for a flavour somewhere between the leaf and seed. In the USA this is how dill pickles are made. Dill Anethum graveolans resembles fennel but is more slender with a matte rather than shiny appearance. Ideally a well drained, neutral to slightly acid soil is best for growing dill. It can bolt easily so try to avoid overcrowding or planting in poor dry soils to reduce the chances of bolting. It is closely related to fennel and planting too close to fennel will lead to hybridized plants, intermediate in flavour and appearance. With regards to companion planting, dill is apparently beneficial to cabbage but not carrots. It does make a good neighbour to the veg patch though on account of the umbels of tiny yellow flowers which attract a lot of beneficial insects that prey on aphids. I’ve done a bit of research on predator attractant plants and yellow umbels do seem to be the best type of flower to bring in those helpful predators to the garden. Dill is easily grown from seed sown in spring and summer. For a steady supply of leaves and to counter any unintended bolting make successive plantings every 3 – 4 weeks throughout the growing season. Staking is advisable to prevent damage to the feathery foliage and in hot weather make sure you keep it watered to try and avoid bolting. Dill can be easily grown in containers but to keep it at its best keep cutting back the foliage. Successive sowings also works well in containers and means you can let some plants bolt and run to seed so you can harvest seeds or the flower heads as well as the leaves. There are several different varieties that you can choose to grow all with different habits. Anethum graveolans ‘Bouquet’ has a bushy habit, blue green leaves and compact prolific seed heads being considered the best for seed production. Anethum graveolans ‘Dukat’ is vigorous and slow to bolt with finely flavoured blue green leaves. Anethum graveolans ‘Fernleaf’ is a dwarf variety with darker foliage, it is slow to bolt and good for container growing reaching 45cm in height with a spread of 15-30cm. Anethum graveolans ‘Hercules’ is excellent for foliage with a great abundance of flavourful, long lasting leaves. Anethum graveolans ‘Mammoth’ is best for pickling being very vigorous, with few leaves and running to seed easily producing large seed heads. Here’s some pictures of seeds and those beautiful yellow umbels that the helpful garden predators find so attractive. Fingers crossed we’ll have a sucessful lambing this year so I’ve been growing lots of Spearmint, Mentha spicata in the polytunnel ready for mint sauce. The origins of the name Mentha lie in mythology Minthe was a nymph, who because of the love Pluto bore her, was metamorphosed by a jealous Proserpine, into a mint plant. The alternative myth is that Minthe was seduced by Hades god of the underworld and his jealous queen Sephony turned Minthe the nymph into a mint plant. There are 25 species of aromatic perennials in the Mentha genus and not all are particularly great for culinary use. I’ve found that a lot of the fruit scented mints, whilst very aromatic, don’t really retain their scent / flavour when picked. Common garden mint, lambs mint or to give it its official name Mentha spicata (Spearmint) is however an excellent culinary herb. Eating the leaves fresh from the plant is an intensley minty experience and the flavour is retained when making mint sauce, using in desserts, cocktails and syrups. It also makes a very refreshing herbal tea. Mentha spicata is a creeping perennial with lilac, pink or white flowers borne in terminal cylindrical spikes. There are a number pf varieties that can add a more decorative look to your herb garden. Mentha spicata var. crispa or curly spearmint has strongly crinkled leaves. 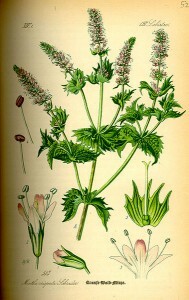 Mentha spicata var. 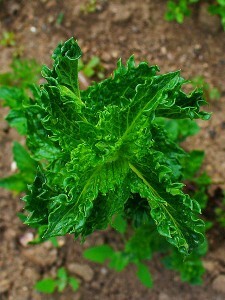 crispa ‘Morroccan’ has a very clean mint flavour and a good choice for all culinary uses. Generally growing mint isn’t a problem it’s growing anything else that can be a difficulty if mint is allowed to rampage freely through your herb garden. Mint spreads via creeping roots so if you do plant in in a herb garden rather than a container sink a large bottomless bucket in the soil about 30cm deep and plant the mint in the centre. This should contain your mint whilst still giving it plenty of space to grow. Mints hybridize very easily as well so unchecked will not necessarily stay true to type as they wander your garden. This vigour of mint means that propagation is fairly fail safe. I’ve grown Mentha spicata from seed very easily and also had great sucess with stem cuttings taken at all times of the year. I haven’t tried root cuttings yet but if taken in spring and with care taken to include a node on your cutting sucess is pretty much guaranteed. When planting mint cuttings and seed I’ve just used a standard compost mix. The other method of propagation mint is division. Every few years dig up your plants and divide. This will dissuade them from producing too many root runners. Mint grows quite quickly so get planting in the next few weeks and you could be making your own home grown mint sauce to have with lamb.